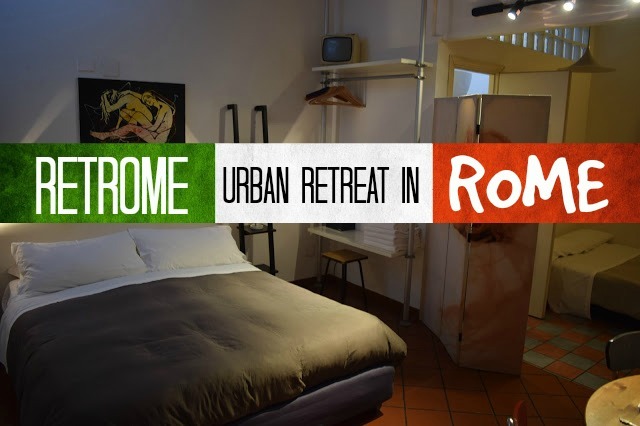 The Retrome, Rome, ticks all the right boxes: superbly located - just five minutes walk from the Colosseum, comfortable and stylish rooms, and their prices won't cost you an arm and a leg. First things first, the Retrome is quite possibly in the best location in Rome - it took less than five minutes to walk to from the Colosseum, BUT, because it's on a no-through road, there is no traffic at all - it's so quiet we couldn't believe how central we were. I don't think we've ever stayed in such a centrally located, yet quiet, place - it was amazing! The location of the Retrome is very easy to find, but like most hotels in Rome we walked straight past it - there is a sign, but it's small and we weren't looking properly. Just know if you get to a dead end, you've gone too far and it's just behind you. Check-in was smooth, swift and we were given one of our favourite things: a map. Not only did this show us where we were, they'd also helpfully noted down their own favourite bars, restaurants and cafes so we could live like real Romans. We were in the Quad Retro Apartment Suite. It is an open space apartment of thirty five square metres with its own separate kitchen and small patio garden. It was big enough for four people and we loved it. We especially loved the kitchen, which was not just fully equipped, but also had useful basics like coffee (the good non-instant stuff), salt and oil. Although it can be fun to eat out for three meals a day whilst on holiday, we personally find it a bit tiresome (and hard for our poor stomaches) so we really loved being able to make a meal at 'home'. Like the rest of the apartment, the bathroom had lots of stylish, cute elements and lots of natural light. There was a generous amount of toiletries too. One thing that really made the Retrome memorable, was its cool and quirky accessories. From interesting art work to retro TVs, the Retrome has a real funky vibe that takes you out of a stuffy hotel setting and into a cool designer home. Another thing we loved about the Retrome is that they provide breakfast (note this is only if you book directly through their website). They don't actually have the facilities to do breakfast on-site, so breakfast is held down the road at a cute little cafe. Here you can mingle with the locals and feel like a real Roman! There are two options for breakfast: Roman Style (sandwich of your choice, croissant of your choice, juice and tea/coffee) or Healthy Style (cereal and yoghurt, croissant of your choice, juice and tea/coffee). They didn't have any vegan sandwich or croissant choices, but there were plenty of vegetarian options. We recommend the Roman Style over the Healthy Style, as the Roman Style was more filling (which makes sense, the healthy option never seems to be filling)! Back to the location, because we can't get over how incredible the location is: so close to the centre of Rome but so quiet? Perfect! Along with being just five minutes walk away from the Colosseum, it's also only five minutes walk to the nearest metro station - Colosseo - from here you can reach any point in Rome and really any place in Italy. The Retrome is also less than thirty minutes walk from our favourite area in Rome: Testaccio. This is where lots of yummy food is, oh and a 2000 year old pyramid! Essentially, the Retrome is the perfect base for whatever you'd like to do in Rome: sight-seeing, shopping, eating... It's nearby to everything and you'll have a super comfy & cool place to return to afterwards. We were really impressed with the Retrome, not just by the location (which simply can't be beaten), but also how stylish, comfortable and quiet it was! It's also very good value! Thus we highly recommend it for your holiday in Rome. To book your own room head over to their website: www.retrome.net/rome/ or find them on TripAdvisor or Agoda. And to stay in touch with us, follow us on Instagram, Twitter and Facebook too! Disclaimer, Travelling Weasels were invited as guests of Retrome, but as always all opinions are our own. We would never recommend anything we haven't personally tried and loved, because that's not fair.